Annual Fund & PTA Campaign Update: We have a PTA Contest Winner! Thank you to ALL of the classes and families who have participated. 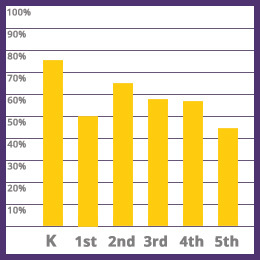 This was a close contest, but we have our winner for the first class to reach 100% in PTA memberships. Congratulations to Mr. Nagatani’s kindergarten class! They have earned a pizza party sponsored by Jules Thin Crust Pizza. They can start working on their pizza that will be added to the Jules Thin Crust menu for a limited time. This was such a tight race, that we could not deny our honorary winner. We are also proud to announce that Ms. Olrich (aka Ms. Leslie) will also earn a pizza party from Jules Thin Crust. Thank you for all your efforts and way to go! REMEMBER, the Annual Fund contest & CREAM party is still up for grabs. October 30th is just 10 days away. Who will reach 100% PARTICIPATION first? Remember, ANY donation in ANY amount counts. Let’s break our school’s record and have all families participate. Donate Online using a credit card or a PayPal account. A monthly payment option is available. Every student counts. Every gift counts. All donations are greatly appreciated.